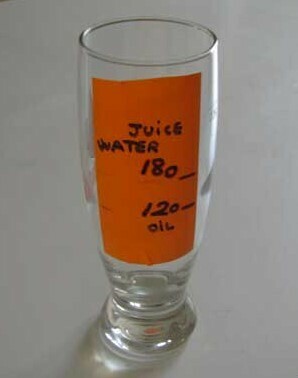 - 180 ml of water. - 1 soup spoon of magnesium sulfate, approximately 15 grams. - Optional : lemon juice (the equivalent of a lemon) to mask the bitterness of the mixture. Advice: prepare the mixture 1 or 2 hours before drinking it. That allows a good dissolution of the sulfate and it is less bitter. Drink in one go by taking a deep breath. Dominique's advice (Switzerland): "Cold water is always more difficult to swallow than warm water at body temperature, so I dilute the table spoon of magnesium sulfate in a bowl of hot water, shake it and drink the mixture using a wide straw !" - 120 ml of oil. - 180 ml of fresh grapefruit juice. - 20 gouts of black walnut tincture. It's useful to kill the present parasites. - 5 grams of ornithine. Ornithine is not indispensable but may help get a good night's sleep. Advice: Drink in one go by taking a deep breath. Try to concentrate on something else, it is necessary to be «somewhere else». Ornithine brings a vanilla flavor which can help.